This page will walk through spring AOP and @AspectJ annotation example with @Aspect, @Pointcut, @Before, @After, @Around, @AfterReturning, @AfterThrowing Advice. AOP stands for Aspect Oriented Programming. @AspectJ is a style to declare aspects in a java class using annotations. To enable @AspectJ, spring AOP provides @EnableAspectJAutoProxy annotation which will be annotated in java configuration. To work with spring AOP and @AspectJ support, we need to create a class annotated with @Aspect annotation. Inside this class we have to create our pointcut and using pointcut we need to create our advice. Spring AOP is used for different purposes such as logging, handling with exception and validating return value of a method. 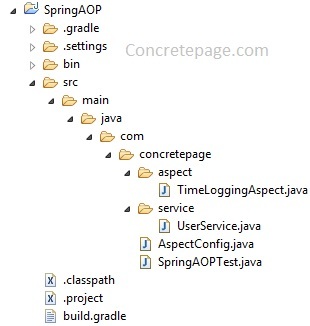 Here on this page we will provide a complete example to work with spring AOP and @AspectJ support using annotation. We should know the AOP terminology to work with it. Aspect: Aspect is crosscutting concern. One aspect can lie in multiple objects. Join point: Join point is a point that represents the execution of a method. Advice: Advice is an action taken by aspect. Pointcut: A scenario which matches to join point. Target object: If an object is advised by more than one aspect, that object is called target object. This is also referred as advised object. Weaving: Linking aspects to other application objects to create an advised object. Find the software used in demo. Find the project structure in eclipse. In java configuration to support @AspectJ, spring provides @EnableAspectJAutoProxy annotation. We use it as follows. To create aspect, we need to use @Aspect annotation at class level. This class will consist all advices. The sample aspect class will look as follows. To define @Pointcut annotation, we need to take help of expression. Pointcut is to determine join points of interest. Find some sample poincuts. 1. If we need to apply our advice to all classes of the package com.concretepage.service, do as follows. 2. To apply advice only for a method of a class, write expression as follows. 3. The below pointcut expression will allow the advice to be used by all the methods of UserService class. The advice can use pointcut in different way. Define the pointcut annotated on a method and that method will be used by advice like @After annotation. The method serving as a pointcut expression must have void return type. The advice can use pointcut directly as an attribute with other attributes. If advice consists only pointcut as an attribute, we can directly write pointcut expression in advice. @Before annotation is used to create before advice. We need to create a method in the aspect class annotated with @Before and define that method. We defined pointcut with @Before annotation. The sample use of before advice can be logging before running the method. To test the application, find the class with Main method. @After advice runs just after a method completes it process. It is declared same as @Before annotation. We need to create a method annotated with @After in aspect class. Run SpringAOPTest and find the output. Using @Around annotation, we can achieve the functionality of both @Before and @After advice. For this we need to create a method annotated with @Around in aspect class. Inside this method use ProceedingJoinPoint.proceed() and before and after of this line, write your advice like logging. @AfterReturning annotation is used to create after returning advice. @AfterReturning has attribute as returning which can be used to get retuned data from a method which is covered by defined pointcut with @AfterReturning annotation. Using AOP we can also create an advice which will run just after throwing any exception. For this we need to use @AfterThrowing annotation to define our advice in aspect class. To work with exception, @AfterThrowing has an attribute as throwing. Find the UserService, in which we are dividing a number by another number. To throw the exception, we will use zero divisor. In SpringAOPTest, we need to use below line. What we will observe that the exception will be caught by @AfterThrowing. Find the output. Now I am done. Happy Spring Learning!